Neighbors 2: Sorority Rising - Blu-ray Review - ReDVDit! Studios need to stop making sequels to original comedy features. Neighbors, released in 2014, was a massive success, bringing in over $270 million worldwide, which is an astounding number for an R-rated comedy. The first Neighbors was great, featured an excellent cast, an original and funny storyline, and was my favorite comedy of 2014. Naturally, money talks, and a sequel was almost immediately greenlit; just because you can, doesn’t mean you should. 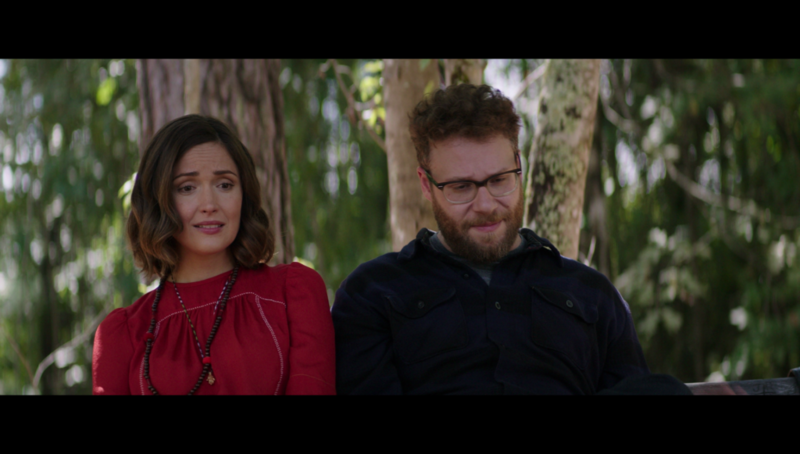 Neighbors 2 focuses on a new sorority next-door to a young couple (Seth Rogen and Rose Byrne) and their toddler daughter, in a shocking stray from the formula of the first film that featured a fraternity next-door to a young couple and their newborn daughter. Thankfully, Neighbors 2 makes sure that we are well aware that this time it is a sorority, as they shove line after line of “Girl Power’ quotes down our throats. Where the original film played so well with the dynamic between Zac Efron and Seth Rogen as adversaries, the sequel pairs them together to battle the sorority girls, led by Chloe Grace Moretz, who is not nearly as funny as Efron was as the antagonist in the original film. Neighbors 2 still features plenty of funny moments, with the majority still coming from Byrne, Rogen, and Efron, but it is just another unnecessary sequel to an already great comedy. Audiences responded as such, with the sequel only making $107 million worldwide, less than half of the original. Hollywood really needs to leave some of these comedies be. Name me a great comedy, and then try to find me a sequel that even comes close to holding its own to the original. Caddyshack 2, The Hangover Part II, Clerks 2, Major League 2; the list goes on and on, and it is full of disappointing movies. The need to capitalize on each and every Hollywood success with a sequel is insane and out of control; we don’t need a franchise for every box office hit. Neighbors 2 features some solid video, but it is fairly average compared to other recent releases. Shot digitally on an Arri Alexa, the Blu-ray transfer is a bit soft, but it does not detract from the viewing experience. At times, the visuals almost look like a TV show rather than a movie (I had a Modern Family feel for many parts of the film), but this may speak to the rising quality of TV more than the lack of quality of this movie. The picture is extremely bright and airy for any sequences that take place during the day, and it is very pleasing to the eye. The darker scenes which take place at night and in the sorority house parties are also very well-lit, and I had no issues with brightness or contrast in those areas. Colors did seem a bit muted at night, but were vibrant at any other time. 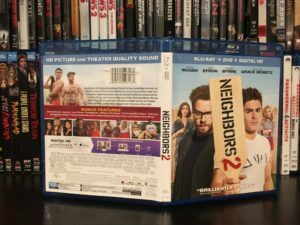 You won’t have any issues with this Blu-ray transfer, but Neighbors 2 won’t make any Top Ten lists for picture quality this year. That being said, in the end this is a Seth Rogen and Zac Efron R-rated comedy, so unless you wanted a better look at Rogen’s chest hair or Efron’s six-pack, you aren’t picking this one up for its beautiful visuals. Sporting a powerful DTS-HD Master Audio 5.1 audio track, Neighbors 2 is a sorority party from start to finish. With plenty of loud music in many scenes, even those outside of the partying, the soundtrack pumps through all five speakers. The subwoofer action is above average, especially for a comedy. To fully experience the more exciting scenes within the sorority house parties and antics, you’ll want a solid subwoofer. Of course, I recommend the PB-2000 from SVS; it has become my favorite piece of my new home theater setup. The dialogue was extremely clear throughout the film, and I had no issues with volume adjustments. At this point, the DTS-HD Master Audio technology has become the baseline standard for Blu-ray releases, and anything less seems insulting to consumers. Thankfully, Neighbors 2 uses this standard, which is efficient enough for a comedy. There was no need for additional speaker play or an upgraded Atmos audio track for this release, and you will be quite pleased with the 5.1 audio. 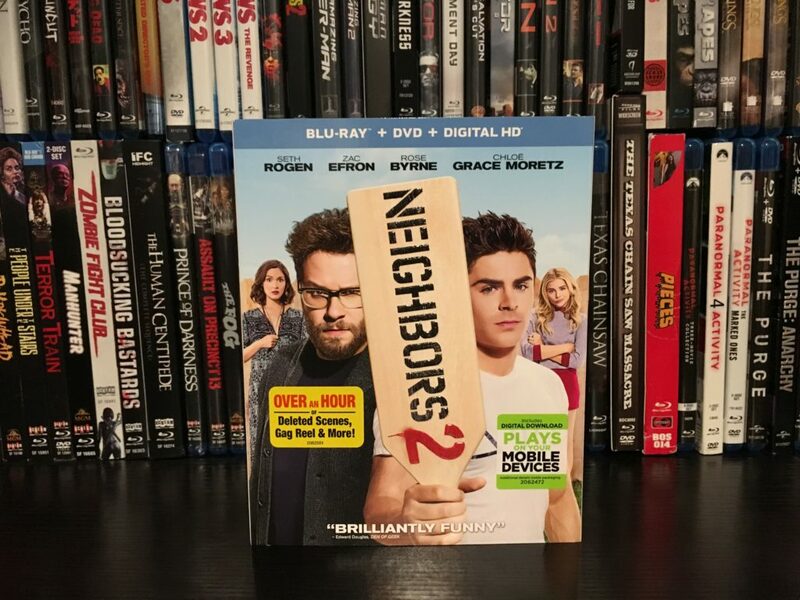 Neighbors 2 comes packaged in a two-disc Amaray case with a slipcover in its original pressing. Inside the case there is a Blu-ray disc, a DVD, and a Digital HD code that can be used on either iTunes or your favorite UV service provider. The artwork on the slipcover and the case are identical, featuring the poster art, and there is no disc art. It is a fairly standard Blu-ray release. Neighbors 2 has its moments, and fans of the comedy genre will certainly get enough laughs from the Efron-Rogen comedy duo, but the film is not nearly as good as the original. The technical points are solid, although unremarkable and fairly average, but they will be just fine to deliver the at-home viewing experience to consumers. My biggest takeaway from Neighbors 2 is that Neighbors 3 is hopefully not going to happen. Much like The Hangover Part II, this movie simply rehashed the first film’s formula with poor results, and this series should now be left alone, or I fear it could get worse. If you enjoy Rogen’s comedies, or want to see Zac Efron without a shirt, you will enjoy Neighbors 2, but for others, I would recommend a rental before you buy. You can find Neighbors 2 on Amazon or at major video retailers everywhere.